A mature Goliath Grouper generally reaches a weight of 400 pounds although the record in Florida for one captured with a hook and line is actually 680 pounds. Some of the largest Goliaths reach eight to nine feet in length and can weigh upwards of 800 pounds. The species as a whole has an extremely slow growth rate. The Goliath Grouper was in serious decline due to overfishing until the 1990’s when they were classified as critically endangered, and all harvesting worldwide was banned. Although their population seems to be making a comeback, it will be many years before the truly giant Goliath Grouper are seen in great numbers again. Goliath Grouper eat young sea turtles, fish and shrimp, for the main part. They also like to prey on stingrays and crustaceans like lobster and crabs. Young grouper commonly hang out together, inhabiting the mangrove swamps and estuaries, where they find suitable food sources in Key West. As a bottom dweller, Goliaths tend to hang out around reefs,wreck sites and coral ledges, as they like to reside in shallow water up to a depth of around 165 feet. 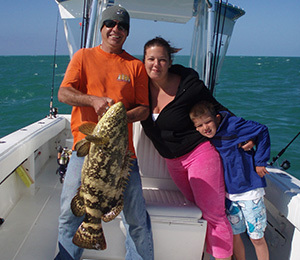 Goliath Grouper can be found primarily in Key West and the Caribbean. 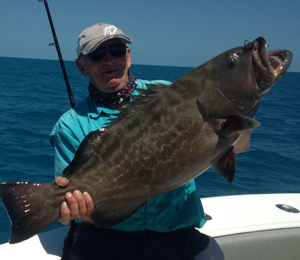 Goliath Grouper, due to their incredibly large size, have been the target of avid sports fishermen for decades; they were also rumored to be a restaurant-quality fish desired by seafood aficionados. Since Goliath Groupers tended to spawn in large groups, this made them easy prey for mass hunting. These factors all inevitably led to a heavy decline in their population. The Goliath Grouper is now protected from all harvesting practices. Grouper hang out around wreck sites, where they can retreat from predators such as large sharks when necessary. 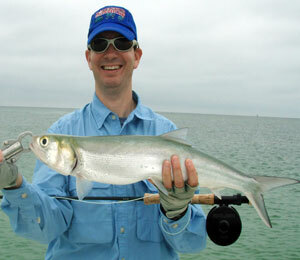 They are easily tempted with large pieces of bait, and can only be caught with extremely heavy tackle. 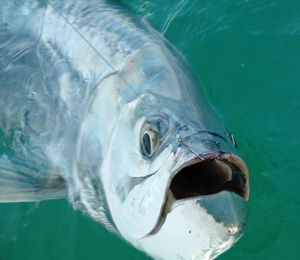 Their enormous size and strength make any attempts to hook one and then haul it in an utterly exhausting experience, although the reward would make all the effort more than worthwhile. Goliath Grouper are catch-and-release fish only.